A few weeks ago I wrote about undergoing a sleep test in March to determine if I suffered from sleep apnea. Sleep apnea is a potentially health-threatening condition where you stop breathing for extended periods while sleeping. As it turned out, I did not have sleep apnea – just good old-fashioned snoring. Since my snoring disturbs Tawn (and I also feel that it may keep me from getting a restful night’s sleep), this morning I underwent a procedure at Bangkok Hospital called somnoplasty. Like the graphic? I made it myself using PowerPoint, then captured and annotated it with SnagIt. 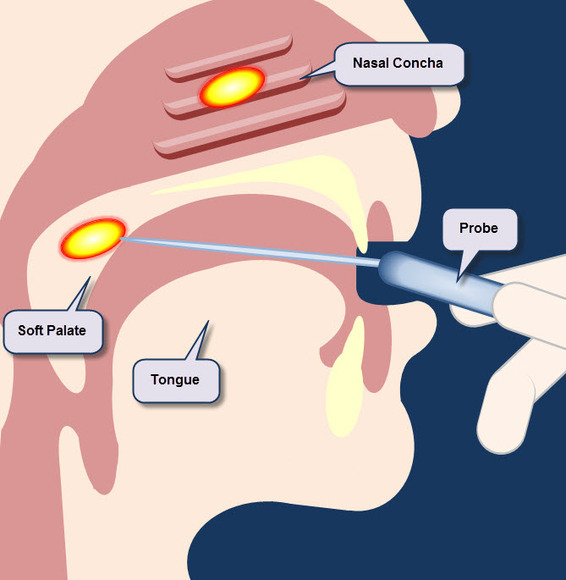 Somnoplasty uses radiofrequency ablation to tighten up the tissues that cause snoring. “Ablation” is the removal of tissue through a variety of means. 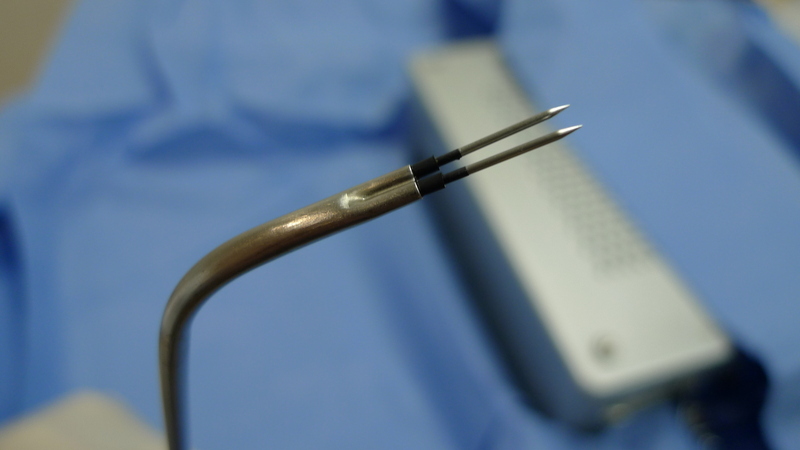 In this case, a metal probe that looks like a very narrow fondue fork pierces the tissue. Then the heat of very high frequency alternating current burns part of the tissue below the surface. As the injury heals, scar tissue forms, causing the surrounding area to tighten up and shrink. As a result, the area is firmer and less prone to vibration – which is what causes the noise of snoring. Research on the procedure shows that 85% of patients experienced significant reduction in snoring, with their average “snoring score” (a 0-10 scale measuring the intensity of the snoring) dropping from 8.9 before therapy to 3.5 after. The procedure is significantly less invasive than other available procedures and my doctor was confident that a single treatment should be sufficient to essentially eliminate my snoring. Once seated in the exam room, Dr. Chidpong placed pieces of gauze soaked in a light anesthetic in my nostrils. He also applied a bitter-tasting medicine spray into my mouth, which started to numb the tissues immediately. Within a minute, my ability to swallow was gone and my teeth were numb. The doctor warned me that I would get the sensation that something was stuck in my throat – and indeed I did – and told me not to panic. A few deep breaths and I overcame that sensation. After about two minutes, he gave me a series of shots – one in each nasal cavity and then three in the soft palate of the mouth. Along the way he asked if there was any pain. The nasal cavity shots were painless – in fact, I couldn’t feel any sensation at all. The shots into the soft palate were mildly uncomfortable, but brief. The shots were a medicine that restricts the blood vessels, so that there would not be any bleeding during the procedure. While giving me the shots, he explained that I would notice my heart rate increasing and within a few seconds, that is what happened. About four minutes into the procedure he took the probe (the two needles are about a half-inch long) and inserted it into one nasal cavity, then the other. If I understand his explanation correctly, he ablated the middle nasal concha (also known as the turbinate), one of three bone shelves that protrude into the nasal passage. Each ablation took about ten seconds. There was no pain nor any smell. Along the way, I did hear a few “pops” that reminded me of when a bug dies in a bug zapper. A couple of times, a feeling of mild panic rose and I had to remind myself to focus on breathing through my mouth. Each time the doctor inserted the probe, he first said “excuse me,” which I found very funny. 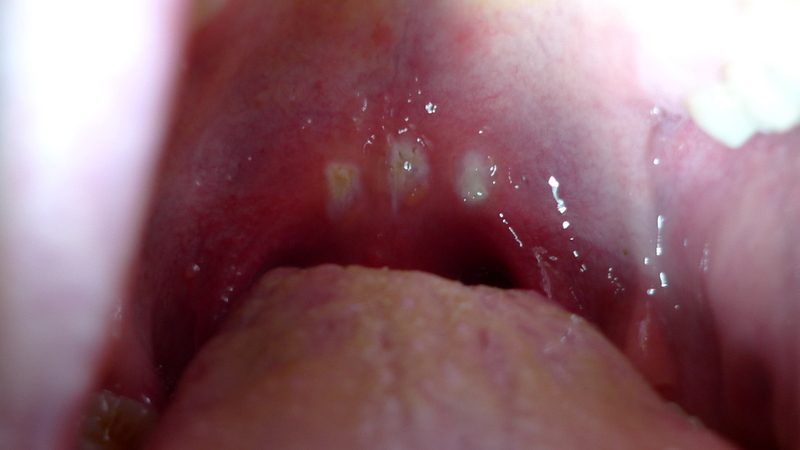 After the nasal passages, the doctor ablated three spots on my soft palate – left, right, and center. The picture above shows the injuries about twelve hours after the procedure. The resulting injuries look like canker sores. The entire procedure took seven minutes. The doctor explained that earlier versions of this technology used less power and the procedure took about thirty minutes instead of seven. Thank goodness for advances in medicine! After the procedure, I returned to the waiting room. A nurse checked my blood pressure a few minutes later. It had jumped from 120/65 at check-in to 150/85 after the procedure. As I waited, I noticed that the anesthetics were rapidly wearing off and the back of my throat and my nasal cavities were itchy. Within thirty minutes after the procedure started, I was downstairs picking up medicines and paying the cashier. Twelve hours later, the sensation is similar to having a bad sore throat. Eating is a bit uncomfortable and I keep clearing my throat, reflexively trying to clear what feels like some phlegm. Of course, the sensation is caused by the wounds from the procedure and no amount of throat-clearing will help. The pain should subside within about three days. I am taking paracetamol for the pain, an antihistamine for any nasal dripping, and an antibiotic as a precautionary measure. The pharmacist also gave me a medicinal gargle with mild anesthetic qualities. I was also advised to eat lots of ice cream, to help reduce the swelling. It will take a few weeks to observe the full effects of the somnoplasty as the scar tissue develops and the surrounding area tightens. I will have to ask Tawn for his perception over the next few weeks, whether or not the snoring has appreciably lessened. This entry was posted in Uncategorized and tagged Ablation, Bangkok, Chidpong, health, Hospital, Medical, Medicine, Radiofrequncy, Snore, Snoring, Somnoplasty, Treatment by christao408. Bookmark the permalink. I zipped through your entry in about 5 seconds. The way to cure snoring is ice cream (recommended by a pharmacist). I will try that tonight. I hope you don’t run into any issues healing. I’m looking forward to Tawn’s feedback. Very brave! I have a similar condition but probably will not go through with it! How much did the procedure cost? I’m glad that’s over. Get well! Good luck ! This is the same procedure I mentioned to you that my associate went through. It worked and he not only sleeps well but his dear wife need not spend her nights hearing him snore his life away. I was happy I was able to skip over the icky part. Very interesting! I’m pretty sure the injection was of epinephrine – it will causethe heart rate to increase and does constrict the blood vessels. I had a surgery and they prepped my nose by swabbing it with a cocaine solution to shrink the blood vessels – boy was that unpleasant! Glad your procedure was quick. My husband would probably have suggested ear plugs if he was snoring. I applaude you for your selfless actions! Heal well! I was on the bus with a guy snoring. We smiled and laughed softly but no one was so offended that he was snoring Sme snores is not that bad to hear. I read the post carefully as I had never heard of the procedure before. Interesting my niece has her tonsils removed and was given all the ice cream she wanted. I new curse all ice cream! Hope the procedure worked for you. @rudyhou – As if I needed an excuse to eat more ice cream… =)@PPhilip – Easier to tolerate a person’s snoring if you aren’t trying to fall asleep within earshot, I suppose! @beowulf222 – In retrospect, taking a few days off wouldn’t have been a bad idea – especially if I worked a job where I had to go into the office. @murisopsis – I’ll defer to your much greater medical knowledge. @Inciteful – Thanks for the warning, huh? @ElusiveWords – How did you do with reading comprehension tests as a child? @CurryPuffy – The procedure was about $500, the same as the sleep test. @Ikwa – The procedure itself wasn’t that painful, but the next few days were very uncomfortable just like a bad sore throat. @catstemplar2 – Excellent! I’ll hope that your colleague’s success bodes well for my own. @Fatcat723 – Don’t curse the ice cream! =D@nov_way – @SistahWarhol – Now about a week and a half later and the swelling is down and the pain is gone. Seems that the snoring has diminished at least somewhat, although we are traveling now so hard to tell. Supposed to see continued reductions in the noise over the next three weeks or so. any updates on Tawn’s sleep interruptions yet?